My mother’s long time friend passed away recently. Joan used to live down the country road from us, one of only 1/2 dozen “neighbors” within a 1/2 mile or so. I can remember her coming down for coffee with my mother many mornings, and how I used to love to sit at the kitchen table and listen to their conversations. I am sure it beat fighting in the living room with my brothers and sisters. Joan also took care of the Twins after they were born and my mother was teaching. During much of that time I was not attending school, as I was having surgery on my legs and couldn’t navigate the stairs at the school. I would spend my days with Joan and the Twins. We would play, watch kids programs in the morning, I would do my homework (which took all of an hour), and eat lunch. After lunch, they would go down for their nap, and this was my special time with Joan. Growing up in a family with 10 kids, you never had a tremendous amount of time alone with an adult, so it was special. We would sit and watch game shows or Soap Operas on TV, and knit. Joan was my knitting idol. She was so fast and confident. I had been knitting for a few years, but it was during this time that I honed my skills. Joan would also always bring 2 bottles of coke for our afternoon snack. We rarely had pop in the house, and this was a treat I looked forward to daily. I would knit on my Barbie Doll Clothes, and she would work on her current afghan, sweater or other project. She was so fast. I would watch her knit, and try to be as quick as she was. I can remember racing her (in my head only). I would watch her when she was at the beginning of a row, and attempt to finish my row before her. I can’t remember if I ever beat her, but I kept trying. I didn’t see Joan for many years as I was at college and starting work. When Sofia was born, my mother took me over and I proudly showed off Sofia, wearing a beautiful sweater that I had knit, of course. I saw her a few more times recently, when I was home visiting my mother. 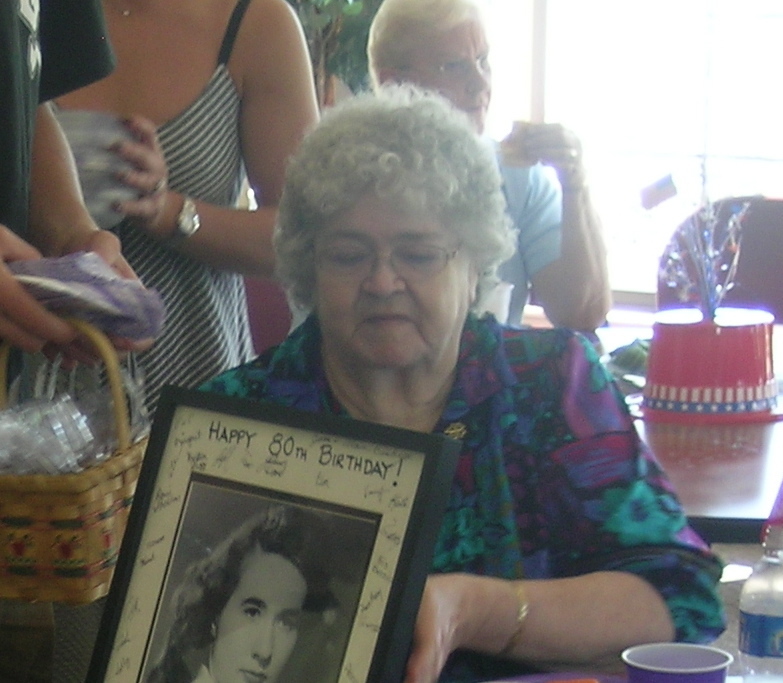 I think that the last time I saw her was at the surprise 80th BDay party that we had for my Mom. I know this photo is not the best, but it was the only one I could find. 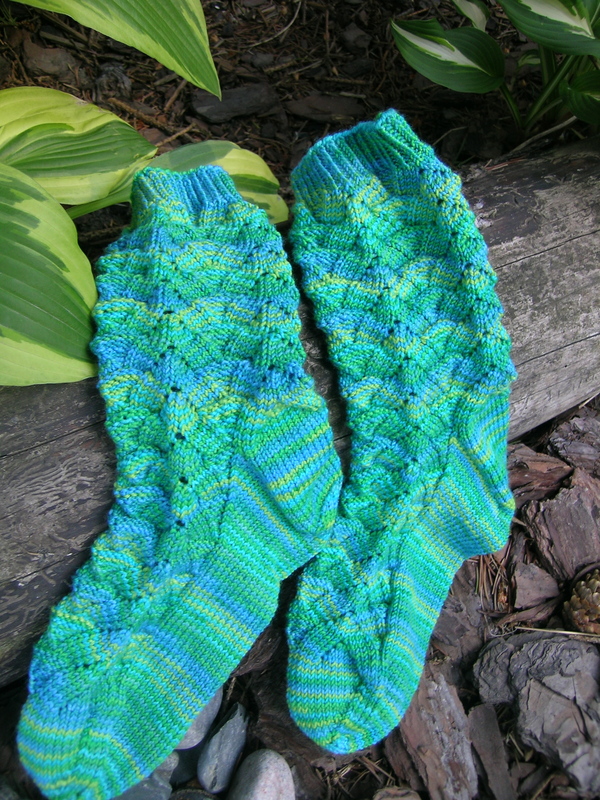 I have been thinking of a note to write to Joan’s daughter, and while I have been mulling over exactly what to say, I have been working on these socks (Monkey by CookieA). I am going to send them along today with my note. I should have made a pair for Joan, but this will be a good tribute from me. Yarn is ShiBui knits sock yarn, 100% superwash merino. Color #3602. I am sorry for your loss I am sure her daughter will appreciate the note and the socks. What nice memories you have of a very special lady. I’m sure her daughter will be touched by your note and the socks. I love the color and pattern of the socks.